ACES > News & Features > Fat versus food: what drives pollutant build-up in predators? Fat versus food: what drives pollutant build-up in predators? Bioaccumulation occurs when a chemical pollutant accumulates in a living organism. Certain pollutants are fat-loving and are driven into the fat of a predator when it eats and digests its prey. But is digestion responsible for the accumulation of pollutants in the fat of predators or does their fat have a higher capacity for holding them? A team of researchers from ACES and the Technical University of Denmark set out to address this question. In an article featured on the cover of this month’s issue of Environmental Science and Technology Letters, Annika Jahnke and her colleagues went after the likely culprit. ”We designed an experimental approach to test the ‘fat versus food’ hypothesis. This question is important for understanding major environmental processes and predict the behavior of new chemicals,” says Annika Jahnke, former researcher at ACES and now at Helmholtz Centre for Environmental Research (UFZ) in Leipzig, Germany. 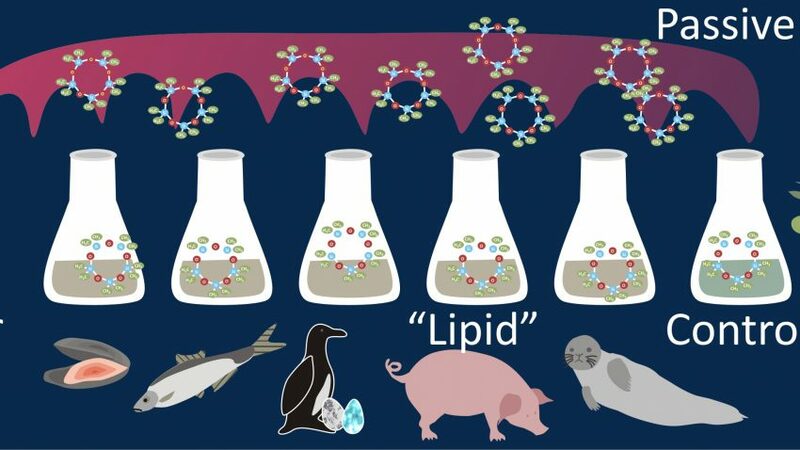 ”If variability in the composition and capacity of fat for chemicals is a major driver of bioaccumulation a lot of monitoring data collected over the last couple of decades might have been misinterpreted,” says Annika Jahnke. So to clear the mud, the researchers extracted fat from mussels, fish, eggs, pigs and seals, and found that it had a similar capacity to hold chemicals. From that, they concluded that higher concentrations of contaminants in the fat of predators are likely to be the result of digestion and not the storing capacity of their fat.